Now, a longtime makeup artist secret is revealed: Tightlining. What is it? Lining the upper lash line to create the illusion of fuller lashes and more defined eyes. 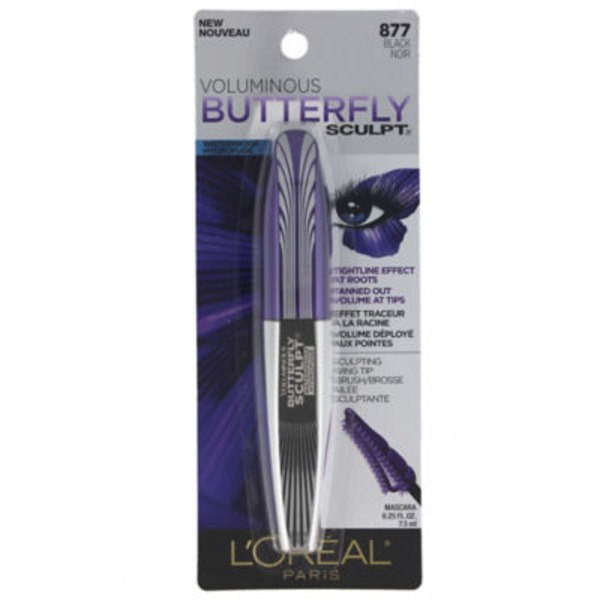 Now there's a mascara that does it for you: Voluminous Butterfly Sculpt. For an intense tight-line effect at the roots and fanned out volume at the tips. Its smaller & tighter bristles come as close as possible to the lash line filling in between the roots to deposit maximum volume for a no gap tight-liner effect. G787755: Isododecane, Cera Alba/Beeswax/Cire Dabeille, Copernicia Cerifera Cera/Carnauba Wax/Cire de Carnauba, Disteardimonium Hectorite, Aqua/Water/Eau, Alcohol Denat., Allyl Stearate/VA Copolymer, Oryza Sativa Cera/Rice Bran Wax, Paraffin, Polyvinyl Laurate, VP/Eicosene Copolymer, Propylene Carbonate, Talc, Ethylenediamine/Stearyl Dimer Dilinoleate Copolymer, PEG-30 Glyceryl Stearate, Rayon, Pentaerythrityl Tetraisostearate, Propylene Glycol, Hydrogenated Jojoba Oil, Ethylene/Acrylic Acid Copolymer, Phenoxyethanol, Soluble Collagen, Silica Dimethyl Silylate, Pentaerythrityl Tetra-Di-T-Butyl Hydroxyhydrocinnamate, Butylene Glycol, Sodium Chondroitin Sulfate, Caprylyl Glycol, Trisodium EDTA, Atelocollagen, Potassium Sorbate, Hexylene Glycol, BHT; [+/- May Contain/Peut Contenir: CI 77499/Iron Oxides, CI 77891/Titanium Dioxide]. F.I.L. Code D180547/1. Tightline at the roots: Position brush at lash root and wiggle to fill gap between every lash.Fanned Out Volume: Pull brush through tip of lashes to sculpt full volume. Doesn't smudge. Removes easily with waterproof eye makeup remover. Tightline at the roots: Position brush at lash root and wiggle to fill gap between every lash. Fanned Out Volume: Pull brush through tip of lashes to sculpt full volume.